The Southern Wind yard in Cape Town, South Africa, has launched Lady G, the third of its 29 metre sailing yachts the SW94. Designed by Reichel Pugh and Nauta Design, Lady G’s predecessors in the performance oriented 94-foot mini-series are Windfalland Kiboko II. Commissioned by an experienced boat owner and passionate sailor, who has already built three smaller yachts with another reputable shipyard, Lady G is a semi-custom project, inspired by the owner’s desire to ensure that both he and his growing family could enjoy high performance sailing in great comfort, even in light winds. Lady G boasts slightly different transom lines to those of her sister ships, as the aft cockpit deck floor has been lowered to emphasize her modern, sporty aspect. Within the 6.6 metre beam, the owner’s cabin forward features two separate double bunks and extra stowage lockers. A fourth guest cabin, with two Pullman bunk beds, replaces the TV lounge in the saloon found on the previous SW94 hulls. 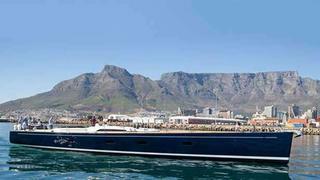 The launch of Lady G took place on February 18 in Cape Town’s commercial harbour, in the presence of the new owner and his family. After full commissioning and sea trials, Lady G will leave South Africa within the next two months and head towards the Mediterranean. Southern Wind Shipyard was founded in 1991 by the Italian entrepreneur Willy Persico, the current Managing Director. Lady G will be presented as a world première during 2015 Monaco Yacht Show. The 52 ton yacht (light) has a draft of 4.50 metres and a 270hp FTP engine. A year ago Southern Wind Shipyard launched hull No 2 of its SW82 series sailing superyacht, Grande Orazio, also in Cape Town. The boat yard offers a range from the 82 up to two versions of a 120 hull, both 36 metres LOA.